Over 5,000 sold, just a few hundred left. WildWords is the Combination Deluxe Pizza of word games. It offers the richest plate of possibilities, decisions, and consequences. No word game has ever been so friendly to all words and so open to your imagination. That same old, same old Scrabble (or Words With Friends) play of one high point letter and a few other tiles is a bottom-feeder in WildWords. And memorizing lists of silly short words offers no significant advantage. WildWords is not driven by low expectations. There are big fish to fry. The focus in WildWords is on high-scoring plays that use all seven tiles to form words with seven or even seventeen letters. You'll play words never seen on a Scrabble board in over a billion games. Even beginners do it. New tiles, board squares, and rules have changed the dynamics for every turn and skill level. So we played and began learning the game. What emerged was a completely new and unexpected world of word play. WildWords brought out new dimensions of strategy and gamesmanship. And it completely rewrote the book of words played with plenty of thrills, challenging situations, and good laughs along the way. Our annual family championship had always been a decent event, but playing WildWords instead was more fun than a barrel of monkeys. My brother, who wouldn't know whether to kiss a jo (Scottish sweatheart) or an ai (three-toed sloth), won the tournament for the first time. Mission (and so much more) accomplished! Don't get me wrong. Scrabble is an OK but very limited word game. The notion that it builds or exercises a useful vocabulary after childhood is, however, folklore. Scrabble's flaws became obvious when players started taking it seriously. They could not win with normal English and masterful tactics as Scrabble excludes most words and is not that subtle. So they started learning hundreds (then thousands) of new official words--all short and mostly gibberish. If you want to play to win, you must match your opponent's hours of joyless and useless memorization. Where's the game in that? Of course, you could also switch to a game with more desirable game qualities. You get better at WildWords by the pleasurable experience of playing it. The wild concept introduces an incredible amount of gaminess beyond Scrabble's anagramming. With AMNINS* as your tray, you could play AN*NISM for antidisestablishmentarianism--the longest word in English when I was a kid. But you don't need a word like that. WildWords includes your complete preexisting vocabulary in theory and in practice. That's tons and tons of words you know but can never use in Scrabble. WildWords was a freak yet wonderful discovery. 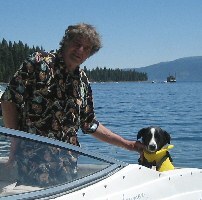 As the caretaker of this serendipity, I felt a responsibility to share it outside of my own family. I have done my best to produce a quality product--the tiles and trays are fabulous. And I did try to keep the price as low as possible while targeting break-even, but it has risen a lot over the years. You can easily join over 5,000 families who have made the switch from Scrabble. The adventure begins on the order page. Thanks for your time and A*ENTION. The average Scrabble play adds 3.3 letters to the board. "Watch them jump" is 4.3 letters per word (i.e., the connecting letter included). For every seven tile play in Scrabble, 12.5 short words are played (by experts). Seven tile plays in Scrabble aren't even long words: LOANERS, SANDIEST. The game has very limited overlap with a normal or useful vocabulary. There is too much word déjà vu for regular players--especially with a J, Q, X, and Z. Strategy, in general, is formulaic with many turns leading to your "first impression" play. A typical game is 30 total turns which can become tedious when the board gets blocked up. To be competitive, you need to memorize "official dictionary" words from AAL to ZUZ. For most of us, it's largely an exercise of our preteen vocabulary. The game encourages the wrong stuff. Note: The average length, median length, and most common length of a word in a reference dictionary are all around 9 letters. "Strengths" is one syllable yet realistically too long for Scrabble with 9 letters. Seven tile plays are frequent (75% for good players) and often involve words 10 to 14 letters long. Even shorter plays can be more interesting words: EQ*X for EQUINOX, P*Z for PIZZAZZ. There is always something to think about. Imaginations run wild. The well-disguised bluff adds a twist of poker to some plays. JUX*ION for JUXTAPOSITION, T*Q*ZER for TRANQUILIZER--even high point letters lead to a wide variety of words. Strategy is a much bigger part of the game and can trump a better vocabulary. A typical game is 18 total turns so every play merits attention. It's impossible to deaden the board. Many games are memorable--amazing plays, comebacks, stupid losses too. Every game is fresh with new circumstances, new words, and something learned. You are often surprised by the words you know but have never used. The game encourages attention to colorful words in conversation and in print. The Bottom Line: More Words. More Game. More Fun. And, No Homework. The Details: A dozen wild tiles can represent any sequence of one or more letters. They have no point value but they sure help in finding 7-tile plays. 20 yellow turn-to-wild squares (about 8 get used) convert (flip) regular tiles into wild tiles and add the opportunity to use an awkward tile for something better. 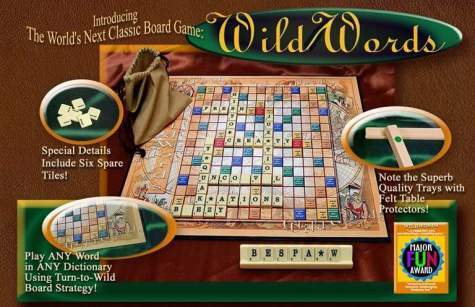 Wild tile functionality and turn-to-wild squares are part and parcel of a game of WildWords. Neither the tile nor the square nor the wildness rule exists in Scrabble, so there is no way in Scrabble to think bigger or better than the letters in your tray. It is not necessary to consider previous plays. Use a wild tile or converted tile already on the board for a new purpose in your play. You just have to defend what you play, when you play it, and only if your opponent risks a challenge. A timely bluff is a part of WildWords. The scoring system is similar to Scrabble with bonus squares. However, the 40 point bonus for 7-tile plays is a major factor in winning games. Four penalty squares diminish the advantage of going first. You may dump all (not some) of your tiles in the bag, mix, and draw a complete fresh set at the start of your turn without losing the turn. That also makes for interesting decisions leading to moments of joy and regret. Game Play: To provide a taste of WildWords, I took five turns making a first play on the board. From in-store demos I have learned that people often make assumptions about WildWords that are completely wrong. The experiment was done once. I drew randomly with no fudging of any kind. I gave myself around a minute and a half to take the turn. Mind you, I have played the game many times and consider myself a good player. Here's what happened. I always look first for a seven tile play. I suspected I would not find one without placing the M, F, or B on a turn-to-wild square and using it for other letters. In a seven tile opening play, you can shift the start of your play to place one of the first two tiles or last two tiles on such a square. You will, however, also cover a 20 point penalty square. (That's why playing first isn't such a big advantage.) In terms of mechanics, I started by turning over the F in my tray and shuffling my tiles to see what that might lead to. I cannot easily imagine words with an F used for a series of other letters without turning the F upside down in my tray. I did the same thing with the M and B. A common sense approach is needed to play WildWords. It's not all brilliant inspiration! The word I came up with was BEFRIENDED. The M was placed on a turn-to-wild square. The blank side is turned up, and the tile may be used like a wild tile. The result was 46 points including the 40 point bonus for using all seven tiles and the minus 20 for covering the penalty square. Again, I looked for help from the board to flip a tile. Probably an A. My word was MAXIMIZES. The X is on a double letter. It's not just about using seven tiles. It's about getting the most out of them as well. The total score was 58 points. BTW, spotting possible words for an opponent's play is a skill that develops quickly but never achieves perfection. And challenging requires considering the current score and the value of the play. Risk factors and player personalities are part of the game. This tray was clearly short on vowels. I looked for consonants that can follow each other--GR, CR. WR led me to my play. Checking later, I discovered that GUTWRENCHING is not a single word. It needs a hyphen. I would have lost my turn had I been challenged. That decision, however, might have been a bit gut-wrenching for my opponent to make. The play was 48 points or perhaps zero in a real game. The Y seemed problematic to me. CHAMPIONED was worth 40 points. Finding plays is often about recognizing series of letters that commonly occur like IONED and then searching for a word that has them. It is important to use up a maximum number tiles to insure you draw your share of wild ones. That's another factor that discourages making plays using just a few tiles. I exercised the unpenalized (once per turn) trade-all-tiles option as this was a crummy tray. I later realized I could have played UNGUARDED to use all seven tiles. One A would have been put on a turn-to-wild square to make it wild--UNGUA*D. A tray is often better than it first appears. You have to avoid making snap judgements based on a Scrabble mindset. BREAKER was worth 78 points. No board help was needed. All my opening plays used all seven tiles which might include a bit of luck but not much. The average score was 54 points. The average length of a word was 9.6 letters though one word was not a word. That happens. Were my plays the best that could be made? Certainly not. WildWords rarely offers obvious choices. There's a learning curve that rises sharply at first but never ends. I would have enjoyed fudging trays and boards to recreate some of my proudest moments like DISCOMBOBULATING (D*BOBU*G) which covered a triple and double word square for 162 points. But that isn't my run-of-the-mill turn and wouldn't be a fair representation of typical. [BTW, the box for my Scrabble set shows the play of the word CHALLENGING. I suspect a Scrabble board is more likely to be hit by an asteroid than have that word played upon it!] While my experiment merely scratches the surface of WildWords, I do believe it demonstrates that the vocabulary of WildWords separates it from every other word tile game in the marketplace. The realistic incorporation of complete English is a revolution in word play albeit a quiet one for now. You are welcome to download the Free PC Version and start gaining experience at finding great plays yourself. It's really quite amusing and satisfying as you get better at it. And it is not a crime to make a five or six tile play of a nine letter word. That's still more interesting than Scrabble! You can also try the link below to some puzzles for your browser. NEWS FLASH (2/9/2018): About a week ago, my brother and I changed our look-up procedure to determine what was a word. Previously, we had used Merriam Webster's online dictionary. The new procedure consisted of typing the word into Google. If a search returned the word in lower case with a definition at some site claiming to be an English dictionary, the word was deemed to be good. We were tired of words we considered to be legitimate not turning up in M/W. Here's what happened in the very next game. A vertical play of PAJAM*S (pajamas) had been sitting on the board for some time with the S just above a triple word score. On the last play of the game an "*" was put beneath it and a seven tile play was formed starting with that asterisk. Both words being tripled, plus the seven tile bonus, plus the penalty for tiles held by the other player resulted in 176 points. The vertical word (PAJAM*S*) was given as "pajamaless." It was not in M/W, but multiple other dictionaries online defined it as "without pajamas." It was a game changing play that would have failed under the rules we used the previous day. You have to love the opportunity to build on existing plays by redefining the letters represented by an already played asterisk! Try Some WW Puzzles Right Now! I was watching CNN shortly after inventing WildWords, and Andrea Koppel used the expression "scared the living bejesus out of them." I thought, "great word, I wonder how you spell it?" My wish was a J and a Z. I looked it up, and an alternate spelling was indeed "bejeezus." The very next day I made the play *JEEZ** with the help of a turn-to-wild square and an asterisk tile already on the board. It drew the challenge I was hoping for. If I had not known the spelling of bejeezus with certainty, I would have said my word out loud in a ploy to discourage a challenge. With this technique, you can succeed with words you are not sure how to spell if you are sure the play conforms to the correct spelling. How many people with a baccalaureate could spell the degree they hold? I just looked it up, but I wouldn't have hesitated to play BAC*ATE and announce it. I don't think an opponent would challenge me to see if I really knew the full spelling. In the same vein, an opponent may spot a legitimate word for what was laid down as a bluff. The post game discussion of unclear plays and situations often brings undercurrents to light and can be quite amusing. There is always a certain amount of "Spy vs. Spy" type thinking that goes on in our family's games. The level of uncertainty in WildWords gives weak spellers (like myself and many others) a break. 3) force players to announce and spell their words when played. With children I would make the rule that the child can survive a challenge if s/he can say the word, and the play does indeed correspond to the proper spelling. In other words, V*QUIST is OK for ventriloquist even if the child spells it VENTRILAQUIST. V*QUEST is not OK no matter what spelling the child offers. This will encourage children to learn and play longer words. Note: I have seen eight-year olds grasp the game well, but I put "12 and up" on the box to be safe. I don't know any of the people whose reviews or comments are included below. Some seem to emphasize the more words aspect. Some seem to emphasize the more game aspect. Either way they find more fun. Watch a play by play between Bush and Kerry (click here). GamesFirst.com: "If you know a Scrabble fan, do them a favor and turn them on to WildWords." CriticalGamers.com: "No longer will you play with only the letters in the tray in front of you -- now the voices inside your head get their turn, too ..."
Silicon Valley Metro: "All these elements completely turn Scrabble on its head ... Who would have thought that an asterisk ... would lead to so much fun?" Los Gatos Times: "It's Scrabble times ten - it's much more creative." Major Fun.Com: "Uniquely profound. Uniquely challenging. Uniquely fun." Take Our Word For It (The Word-origin Webzine): "... a rollicking good time. What a great idea!" "I think that if this game was first, and Scrabble were recently invented and marketed as a 'better WildWords' - that most people would probably just laugh it off." "A wonderful word game! It is similar to Scrabble, but I much prefer Wildwords to Scrabble. The wild tiles and spots open up this game in a way that can just not happen in Scrabble." "OK. I do not like Scrabble. I love word games. But these ... changes make the game so much more fun and accessible." "My friends who love crossword puzzles love this game leaps and bounds more than they like Scrabble." "This is way more fun in teams! You can tell your partner your insidious plan that you can't work out, and she can give you something that fits it, and vice versa. Ah, the satisfaction of playing F*Q*Y, and getting a unanimous challenge from every opponent. (FreQuencY was the play)." "I think Scrabble is more for knitters and stamp collectors. WildWords is more for bungee jumpers and skydivers." "Thanks for all you have done to make my life way more exciting with long interesting creative words on this board and thinking way outside the box to win. Finally a game where poets and wild thinkers can win, rather than spreadsheet-oriented rule-followers!" "I adore this game! I'm a pretty serious Scrabbler--not tournament level, but I love the game and take it a mite too seriously. This is a different game entirely. Double and triple words matter, but the real challenge and joy to this game is using all of your tiles. A good player can do this quite often with creative asterisk usage and judicious use of the "tile trade-in" rule. Plus, none of my friends will play Scrabble with me anymore, but they'll try this game. Sometimes they even win!" (comment found at YouTube). "My Mum is a Scrabble addict and adapted to the game quite well. Hopefully I can transform our Scrabble-addicted family to a WildWords-addicted family by next Christmas. I HATE Scrabble and loved this new game for its flexibility." "It works remarkably well in German but in an ideal world the distribution of letters would be slightly different (of course). The English version is just great & brings out a mischievous streak in people ;-). "So congratulations on what we think is a brilliant game and much more fun than Scrabble. Hope the game really takes off for you. And thanks again... I'm sure we'll have many many more nights of verbal creativity & laughter with this." "One thing we like - it's really a crap shoot, and our games are sometimes very close, while other times one of us just slaughters the other. I'm inclined to "bomb" every play I possibly can, where her strategy is denser." "I wanted to let you know that I purchased WildWords a few months ago. Since that time I have fallen in love with this game! ... I appreciate your work in producing this game. Wild Words is always a joy to play. Thank you for your efforts. " "I love your game. It's fun and outside the box and brilliant. ... , thanks for sharing your great idea with us! " "This fixes everything wrong with Scrabble." "It's what Scrabble should have been." You don't have to be a genius or wordsmith to enjoy the freedom of WildWords any more than you have to be a race car driver to enjoy driving a Lamborghini around the block. No matter what, it's fun to play more interesting words. If you are worried WildWords could not work in the context of a highly competitive and intellectual environment, you are completely wrong. The game offers its experts incredible depth. And when you add a chess clock and the pressure of time, well, bring your best deod*nt and possibly d*pers. "Come one, come all, faqirs and qaids, vavasors and chalutzim, soucars and judokas, kabakas and kamaainas. An oe of flux is shaking the Scrabble aalii, so put that quaich of kvass in its zarf, scrape together your sous, zaires, xu or prutah, put on your zoris or chukkas, and climb in your troika, caique, bidarka or quadriga and make like a jehu (not an ai) to your closest souk to buy WildWords!" I suppose WildWords could end up a novelty item from the early 21st Century that your descendants might take to a future episode of Antiques Roadshow. Foreign Languages: Because of the 12 wild tiles, turn-to-wild squares, six spare tiles and the emphasis on seven tile plays, WildWords can be played in French, German, Spanish, and other Roman languages quite reasonably. Using a Scrabble Deluxe Set: It is possible to take advantage of your Scrabble Deluxe plastic grid and rotating base when playing WildWords. Color printer, scissors, and scotch tape required. WildWords tiles will fit the grid, and a printable paper board can be taped to the back of the Scrabble insert board for convenient flipping. This option is free to WildWords owners. Contact me for info on how to print such a board. Comments, Feedback, Great Marketing Ideas, Questions? Whatever your comments, they are always welcomed and answered. Please remember your spam blocker could block a response. Responses will come from roizen@ix.netcom.com You may also use that address to send email. Go to the "More Game Info" page for examples, tips, etc. The "Download Page" has a free 2-player or practice Internet version for a PC.